About neurosurgery procedures: Some treatments for nervous system diseases include surgery, most of which are performed by a neurosurgeon (also known as a brain surgeon). There are hundreds of different types of neurosurgery procedures ranging from the minor and simple to quite extensive and complicated. 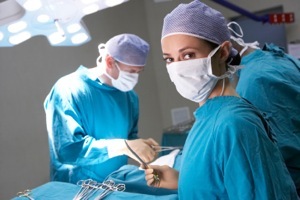 This page has links to explanations of some of the common types of surgical procedures with information about what they are and what they are used for. Some may include very specific surgeries while others may be a general term for a type of procedure that may be used in many treatments. Anterior Cervical Discectomy and Fusion: Because it is not generally safe to access herniated discs in the neck from the back, treatment of these usually requires this anterior approach. Burr Hole: This term is used a lot in describing components of various neurosurgery procedures. Learn more about what a burr hole is and how it is used in neurosurgery. Chiari Decompression: The most common neurosurgery procedure used to treat Arnold Chiari Malformation. Craniotomy: Like burr holes, a craniotomy is often mentioned in the surgical treatment of some brain diseases. Learn about what this basic component of many brain surgeries means and how it is used. Diagnostic and Imaging Procedures: Although not technically surgical procedures, there are a number of imaging scans and tests used in the diagnosis of nervous system diseases. Learn a bit more about the imaging, testing and examinations that doctors use to diagnose patients. Endoscopic Third Ventriculostomy: Some forms of hydrocephalus may be treated without the implantation of a shunt (see below) and can be treated effectively with this endoscopic procedure. Epilepsy Surgery: The first line of treatment for most types of seizures is medicine. However, some patients who do not respond adequately to medications may be offered surgical options and there are a number of different types of procedures that are used to both diagnose and treat epilepsy. Learn more about them here. Foramenotomy (Foraminotomy): Another spinal procedure, a foramenotomy may be used as a component of many types of spinal procedures. Laminectomy: A common type of procedure to access and decompress the spine, a laminectomy may be part of many spinal surgeries. Learn about what it is and how it is used here. Lumbar Puncture (Spinal Tap): The gold standard test for diagnosing meningitis, a lumbar puncture may be used in the diagnosis of a number of different diseases of the nervous system. Microdiscectomy: One of the most common procedures used to treat a disease of the nervous system, this procedure is the way that most herniated discs in the lumbar spine are treated. Pituitary Tumor Surgery (Transsphenoidal Surgery): Most pituitary adenomas, benign tumors of the pituitary gland, are treated by surgery through a route called the transsphenoidal approach. Spinal Fusion: Fusion of the spine may be necessary in a number of spinal disease conditions, from degenerative disease to trauma. Learn more about what it is and why it is used here. Ventriculoperitoneal Shunt: One of the classic treatments for hydrocephalus, a shunt is an internal implant that helps divert fluid from the brain. Learn more about it and its uses here. Ventriculostomy: A ventriculostomy, a tube placed into the fluid spaces within the brain, is a common procedure that may be used in a number of different clinical situations. Learn more about them here. Return to the top of the Neurosurgery Procedures page.